You will need to create an event before you can send an invitation. This enables you to fully utilize all of our invitation management features such as the invitation list and the guest list to keep track of responses. This tutorial covers how to create and manage your events. Create your event in 3 easy steps! Step 1. In the navigation, go to Invitations > Create an Event. Step 2. Provide your event information. The only required fields to create an event are event name, date and time. Step 3. Provide optional information to best help you and your guests with the event details. End date and time can be used if the event has a specific end time or the event lasts for more than one day. Captcha protection should be used if you are linking to an invitation response form a website, social media or any other method that doesn't enable you to control your guest list. Location Information is optional but is very helpful to guests. This option lets you supply a street address, a link for directions using Google Maps or one you provide, and additional instructions or directions such as where to park or what to do first. The information you provide will be included on the event response confirmation your guests receive. Enable guests to reply "maybe"
Confirmation message that appears after their response has been recorded. Different messages can be provided for yes, no and maybe responses. Receive an email notice when someone responds (every time or once per day). If you choose to receive an email every time, the email will contain the full details of the response. RSVP Requirements enables an RSVP By date which displays on your invitation. If you enter an RSVP cut off date, this will prevent people from signing up after that date. You can also limit the total number of attendees allowed for your event and a custom message can display when the attendee limit is reached. Edit Event: Your changes will be seen on any new eCard invitations you create. 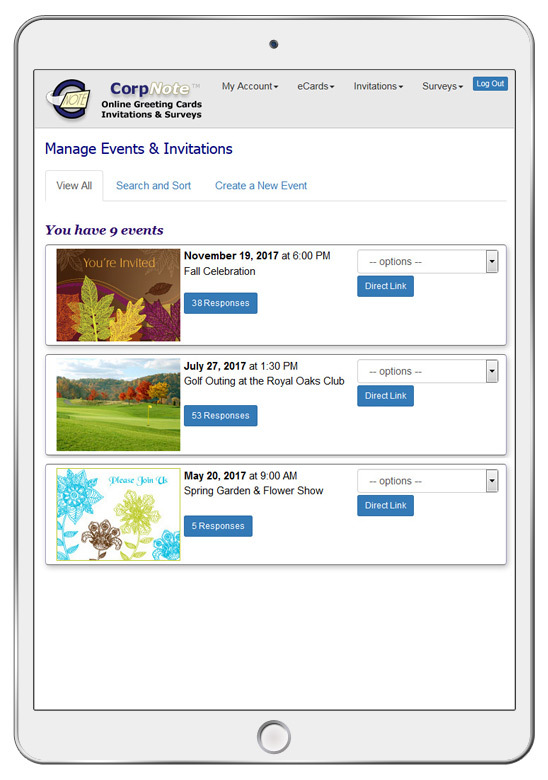 Invitations that have been sent cannot be edited; but, when any eCard recipient clicks to RSVP or uses a direct link to the response form, they will see your changed event information on the RSVP screen. Add a Response: You can add a response for someone by completing the event RSVP form for them. You can also check a box to have an email confirmation sent to the guest. Send Reminder: This option only appears if you have responses. You will be taken to your RSVP "responses" where you can select who to send the reminder to. Refer to the Managing Event Responses tutorial for more information. Copy Event: An exact duplicate of the event will be created with the exception of the event date. The event name will have the word 'COPY' in it, so that you know you are working with the copied version, but you will need to remove that text before you save your new event. Delete Event: If you delete an event, the event and all responses for that event will be permanently deleted. thumb_up Click the "Direct Link" button if you want to link directly to your invitation response form from your own email program, website, blog, Facebook, Twitter, YouTube etc.